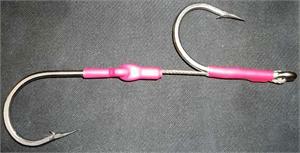 Double hook set - Features: Mustad 7732 front & rear rigged on 3/32 cable with heat shrink over the connections. Double hook set - Mustad 7691s front & rear rigged on 3/32 cable with heat shrink over the connections. Single Mustad 7691s hook set rigged on 3/32 cable (900 lb), Nicopress crimps, Chafe Gear, and all connections heat shrink sealed. Single Mustad 7732 hook set rigged on 3/32 cable (900 lb), Nicopress crimps, Chafe Gear, and all connections heat shrink sealed.